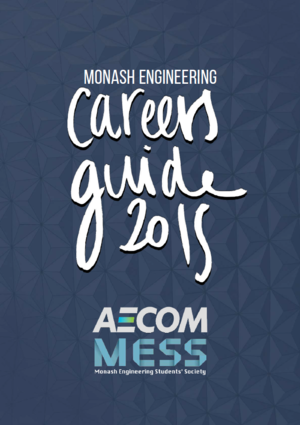 The Monash Engineering Students' Society proudly present the Careers Guide for 2019. For the past 12 years, MESS has created an invaluable academic resource to assist and guide our past, current and future students in their careers. The 2019 MESS Careers Guide is no exception and we are excited to provide you with a Guide that hosts such a comprehensive collection of information and organisations. Over the past decade we have developed strong partnerships with a variety of industries. These industries include not only the various fields of engineering but also other areas that students may not have considered as a possible career path. These connections and partnerships, which we wish to pass onto you, ensure you have the right knowledge and skills to follow your passion in the current workplace. The Careers Guide also initiates our 2019 Academic Program. The Academic Program provides a broad collection of resources and opportunities for both sponsors and students. This is done via a range of events that include formal and informal networking evenings, industry visits, seminars and honest advice from students that have been in your position. Get involved! We understand, it is a big scary world out there, however, University is as much about developing relationships as it is about your studies. To that point, this year, we aim to make it as easy as possible for you to attend our events, ask any questions you may have, find any information you may seek or pursue any opportunities that may pop up.